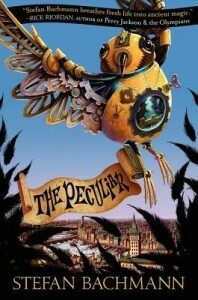 The Peculiar is the tale of an alternative England where a Cold War between the Faeries and Humans insinuates itself through the magic infused steampunk streets. Our main concern is Bartholomew Kettle: a changeling, along with his younger sister, born of a human mother and a faery father who has long since flown the nest. He finds himself in the midst of frightening intrigue which threatens the brittle peace, and which requires a changeling to further the agendas of those hiding in the shadows. I can tell you now that fans of anything steampunk, and of ethereal â€˜properâ€™ fae tales, will love this story. The clockwork machines which fill the cities â€“ serving a dual purpose of making life easier as well as drowning out the magic which would otherwise lie heavy in the air â€“ are beautifully described and give the world its own very particular enchanting identity, Bachmann is extremely good at describing the scene and capturing the details you want to â€˜seeâ€™. Heâ€™s also quite adept at creating a menacing atmosphere â€“ the villains in the story make the hairs on the back of your neck quiver with unease, if not quite standing on end. An area in which I feel he is significantly weaker would be how engaging the main thread and protagonist are. I found Kettle to be unlikeable, selfish and at times boring or plain stupid. I think that it is entirely possible to have a character such as this as key figure, as long as they are also engaging. However, I very quickly did not care a jot what happened to him, although I remain very interested in his sister, Hettie. It seemed apparent that Bachmann had struggled with back story and depth to some of the characters too; one character is done away with towards the later parts of the story, and the tone of things goes quite flat without any resonance for the sadness of how this has happened. It left me feeling very much that certain (or all) of the characters were like functional little cogs and screws being fit together and discarded in the clockwork of Bachmannâ€™s story, rather than becoming fully rounded figures of their own. Having said this, I think perhaps the best character of the whole book is Arthur Jelliby â€“ he does go through some development and is the most reassuringly human and fallible in his reactions and actions. All in all, it is an enjoyable read which employs many of the best fairy tale devices and ideas in what Iâ€™m sure is going to develop into a strong series â€“ the ending is a complete cliff hanger and I canâ€™t see why any publisher wouldnâ€™t already have Bachmann writing the sequel.